As of July 19th, the Canadian Food Inspection Agency (CFIA) and the Lebanese company Produits Phoenicia Inc. are warning the public not to consume the Cedar brand Tahini described below because the product may be contaminated with Salmonella. 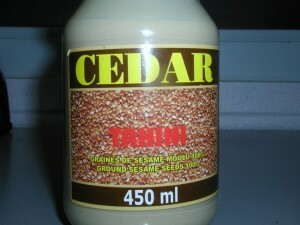 The affected product, Cedar brand Tahini is sold in 450 mL jars, bearing UPC 0 62356 50178 5. There is no lot code on the packages. This product has been distributed nationally, but there have been no reported illnesses associated with the consumption of this product. The manufacturer, Produits Phoenicia Inc., Saint Laurent, Quebec, is voluntarily recalling the affected product from the marketplace. The CFIA is monitoring the effectiveness of the recall. for more information on this, you may refer to the Canadian Food Inspection Agency health hazard alert here. Posted: July 21st, 2010 under Health, News.